Do you have an urgent package that requires rush delivery? Using a courier service to handle the urgent package is an easy and affordable way to ensure it’s delivered fast and on time. Despite the fact that mail volume has dropped in recent years, demand for couriers is forecasted to grow between now and 2026. That’s because more companies are recognizing the additional value these services provide compared to traditional shipping methods. If you have important paperwork that needs to be delivered immediately, use a courier service. Courier services are great for e-commerce businesses, too. Keep reading to learn how to manage your urgent packages through a courier service. When you think of a courier service, you probably think of someone riding a bicycle through downtown streets, weaving in between cars. Courier services have evolved from that image. They look and act professional, and they’re fast. Courier services can even be used when you travel. They deliver important documents door to door. You can also use the services for sending packages. The good news is that with a courier service, you don’t have to rely on standard mail or three-day shipping to get your package sent quickly. There are many options available for shipping products. There’s overnight shipping, same-day shipping, three-day shipping. Instead of relying on traditional shipping methods to get your packages delivered, consider working with a courier service. These are the main reasons why you want to use a courier service. Are you in a situation where you have documents that need to be delivered immediately? You can’t afford to leave the office because of time constraints, yet this needs to get delivered somehow. You could send an employee out to make the delivery, but that means an added liability to your business if something happens. You’re also paying the employee’s hourly rate to deliver that package, plus mileage. That’s when you contact a courier service. Would you like to have peace of mind knowing that you can count on a courier service that can pick up a package within an hour if necessary? Courier services offer incredible flexibility in when your package gets picked up, and when your package gets delivered. Shipping companies can’t give that kind of assurances. The best they usually do is a three-hour window where they pick up or deliver your package. In those times when you just can’t afford to wait around, you’re better off calling a courier service. Packages that go through courier services have limited handling. That means that there aren’t that many people that handle your package. Sometimes, only one person is handling your delivery. There are extra care and accountability that goes into handling your packages. You can be assured that your package will arrive safely. Have you ever had a document rushed using a standard shipping company? It can cost quite a bit, and you can expect rates to increase in 2018. A courier service usually has less operational costs, which means those savings are passed on to customers. It doesn’t get any easier than scheduling a pickup online, receiving your quote, and placing an order. Should there be a last-minute change to your order, you can pick up the phone to call the service and make the change. You can’t do that with other shipping companies. They don’t have that type of flexibility. Plus, most courier services are available after hours and on weekends. We live in a world of instant gratification where anything we need is available with the click of a button. This has caused customer expectations to be incredibly high. Usually, when customers order products online, they get delivered in a few days. Imagine if your customers order a product online and it gets delivered the same day by a professional, uniformed driver. You’ll exceed customer expectations, build trust and credibility for your business. Your customers will be likely to order from you again because items were delivered so quickly. Do you have a franchise or multiple business locations? There can be added headaches getting important documents from one office to another. Courier services can take care of that for you, without the need of driving documents between locations yourself. With a courier service, you have many options available to manage your urgent packages. Your situation will determine which option is the best for you. These examples are all services provided by ASAP Courier & Logistics. You can schedule when your package will be delivered. There’s a service that will deliver your package the next day by 5:00 p.m. If you need same day service, that is available provided your package is picked up by 10:30 am. There’s also a rush service that picks up your package in an hour and delivers within three or four hours, depending on the county where it needs to be delivered. 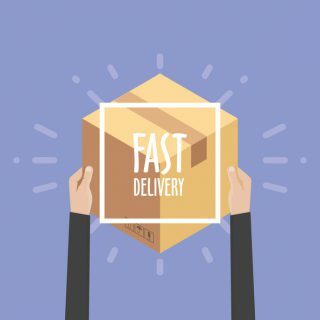 If you need something that is very urgent, there’s the super rush service that picks up your package within an hour and delivers directly to the destination. Are you working on a project until midnight that needs to be physically delivered across the country by 9 am the next day? You don’t have the option to email it, you can’t call the post office or any other shipping company. You can call a courier service like ASAP Courier & Logistics. We can pick up your package, put on the next flight and have it delivered to the top 50 markets in the U.S. It can be incredibly stressful to have a package that needs to be delivered immediately. A courier service is an affordable option that gives you peace of mind. You know that your package is in excellent hands, and it’s incredibly easy to use. With ASAP Courier & Logistics service, your urgent package delivery isn’t limited to cross-town deliveries. We can get your urgent package delivered to any destination. If you’re in South Florida, contact us to get your rush delivery quote today.